ASOL is not just a process of shipping computers, but more. A complete package, enabling under resourced overseas schools to provide first time access to millions of children lacking even the most basic resources. This comprehensive package including; Teacher training, Curriculum development and business planning to ensure development and self sustainability of the program. West versus the developing World! A global disparity exists between Western and Developing World. The West representing 20% World population have access to health care, education, drinking water, electricity, etc . The 80% cannot say the same ... Some divide! Why Computers? It's a valid starting place. Agree or disagree I.T is a Global process affecting us all, however for many access to broadband, IPad or play station remains an unattainable dream. Logic then says; given this global platform and reliance on IT, varying and necessary skills are then required. Especially for developing countries where the skills divide remains significantly disproportionate to that of Western countries. Thus far in excess of a billion pounds of finance and equipment have been expended on wide ranging ICT / school projects undertaken by eminent institutions including the World Bank, European Union & Microsoft; unaudited and sadly with limited benefit or sustainability. Failure is a harsh word, breakdown of such projects is due to various of reasons; however experience suggests the key reason has been lack of local ownership combined with Vision and skills limitations. To this end CfC developed a grass roots model, which has proven to be highly successful. DFID (Department for International Development) Quote "We have witnessed many ICT schools projects in Africa, but "African Schools on Line" is one of the few projects we have seen that actually works"!! This success has been achieved by assessing ,identifying and addressing potential limitations of local education provision and skills levels in schools, thereby aiding the development of wider working partnerships i.e schools sharing resources or opening facilities for community benefit. Our program fosters local ownership for state and independent Primary and Secondary education, whilst involving the local community to view and grasp the bigger picture of the actual potential for supporting such initiatives including access to training, adult education, social enterprise, etc. • Even though it is often cheaper to ship computers & equipment to far away regions than purchase locally. Supplying computers on their own is not a solution. Criteria include; Site assessment, Skills analysis of personnel, undertaking by participants to maximise usage of resources including provision for shared access to neighbouring schools, community, etc. The package provides all the necessary tools for a successful outcome, including equipment, assorted training including Curriculum development, Business skills, Software and Hardware development. However for the majority displaying and achieving the required developments, ongoing support including access to vocational initiatives developed by CfC are made available. Results speak for themselves; our Zimbabwe schools program alone yielded 100% GCSE level exam results in computer studies. Who has financed all this? 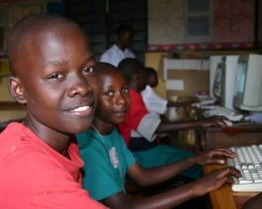 Beginning in 1995 with a single request to supply computers for three secondary schools in Zimbabwe, Simon Rooksby (Founder) went out put it together, but it was due to the shared Vision and support of Air Zimbabwe, Harare Anglican Diocese, and Zimbabwe Ministry of Education the project was extended to a further 100 schools, including the setting up of a teachers network, annual conference and as outlined a myriad of community benefits aiding infrastructure development. £5000 dependent on country & location represents shipping a 20' shipping container to enable supply & installation of equipment and resources for 20 projects. We don't want to stop these programs. Funding and Support is needed not just for for "African Schools on Line" but other continents too.... With a worldwide financial uncertainty continuing to rage much support has been reduced or stopped... New supporters / sponsors including support from shippers are needed. Fund raising is one of many ways to help; including the tax benefits by gift aiding or corporate gift aid which do make a difference. Daily CfC receives 100's of requests worldwide requesting access to "African Schools on Line", help us to provide the positive response. Yes we can help!